grasim industries ltd ( gil ), an Aditya Birla group company, sought the permission of the Kerala government to close down its viscose plant located on the banks of the river Chaliyar at Mavoor, Kozhikode district. The company also posted copies of the notice to the trade unions on August 23, 1999. The closure threatens to render about 3,000 people jobless. The reason given by the company for the notice is the state government's unwillingness to supply the required quantity and quality of raw materials. The last contract for supply of raw materials at subsidised rates ended on August 31. Unofficial figures estimate that in the last 10 years, the losses sustained by the state exchequer on account of the subsidies on raw material prices allowed to gil is at least Rs 2,500 crore. The story of gil 's Mavoor plant is very complicated. The pulp plant has been at the centre of a 30-year-long struggle carried out by the people of the adjoining areas against pollution caused by the factory. And whenever the company has been pressurised into cleaning up its act, it has responded by threatening to close down the factory. In a state where unemployment is a major problem, the government just cannot afford the adverse publicity that a closure will attract. On the other hand, the Chaliyar Action Council ( cac ) of Vazhakkad village near Mavoor, which has been involved in the protest against the pollution caused by gil , had moved the Central Election Commission in the second week of August 1999. The council sought to stall the state government's reported move to enter into a new raw material supply contract with gil , saying that this would be a violation of the electoral code of conduct. "The management of gil has been using trade unions to pressurise the state government to provide cheap bamboo and hardwood. In 1998, it almost got 30,000 hectares of forest land for captive plantation from the Kerala government. It was only after some non-governmental organisations petitioned the Central government about this move, which was a violation of the national forest policy, that the Kerala government scrapped the move," says Chandra Bhushan, coordinator of the Green Rating Project ( grp ) of the New Delhi-based Centre for Science and Environment ( cse ). The project has recently completed the first-ever rating of the Indian pulp and paper sector in which gil was placed at the bottom of the pile in the rating with a ranking of 25 among 28 pulp and paper units. The rating had revealed that the company's efficiency in the use of fibre -- for which the company is now threatening to close the mill -- is as low as 29 per cent, meaning that the unit consumes 3.44 metric tonnes of wood and bamboo to produce one metric tonne of pulp. It was also noted that over the years, the company has made no effort to improve its fibre-use efficiency. "Instead of adopting all the measures to control pollution, as suggested by the Sengupta Committee that was constituted in 1997 to look into the matter, gil has been bargaining with the government on bamboo and hardwood prices on the pretext that if the pulp plant closes down, the employees will suffer major hardships," Chandra Bhushan adds. Wood: reserved for the polluter According to gil 's company profile prepared by the grp team, the pulp factory consumes about 200,000 tonnes of raw material annually, including bamboo and hardwood from the forests of Kerala. "This has caused massive deforestation as well as conversion of natural forests into monoculture plantations of Eucalyptus and Acacia," says an appeal issued by cac . The state government has been providing bamboo, eucalyptus and other wood at subsidised rates to gil since its inception in 1963. When the factory was set up, the state government agreed to supply bamboo at the rate of Re 1 per tonne to it. In 1974, the price of eucalyptus was fixed at Rs 22.50 per tonne and that of other wood at Rs 15 per tonne. In 1986, the price of bamboo was raised to Rs 400 per tonne by the state government and the management responded by closing the factory for two years, alleging labour disputes. Meanwhile, some workers committed suicide, and the management used this as an issue to strike a bargain with the government, forcing it to reduce the bamboo price to Rs 250 per tonne. At that time, the government rate for bamboo was Rs 1,079 per tonne in Maharashtra and Rs 1,077 per tonne in Assam. cac points out that unsustainable extraction of bamboo and reed for the industry has depleted the forest resources. "This has denied raw mate-rials and jobs to nearly 300,000 families that used to earn a livelihood weaving bamboo and reed mats and baskets... while the factory enjoyed heavy subsidies on the price of raw materials. It has to pay just Rs 426 for one tonne of bamboo, while the tribal artisan is forced to buy the same from the open market at prices ranging from Rs 3,000 to Rs 5,000 per tonne," says C Surendranath, a representative of cac . "The loss to the state exchequer on account of the subsidies on raw material prices allowed to gil alone would be a minimum of Rs 750 crore per year. The cumulative loss suffered by the state in the last 10 years is assessed to be at least Rs 2,500 crore," points out cac , quoting estimates prepared by the Kerala Shastriya Sahitya Parishad ( kssp ), a civil society group of the state that also runs an environment centre in Kochi. The notice given to the trade unions has listed a variety of reasons that have made the unit 'economically unviable'. A significant point in the notice is that in addition to the 'lakhs of rupees already spent', the company cannot afford to spend another Rs 2 crore for implement ing pollution control measures, indirectly referring to the recommendations of the Sengupta Committee.
" gil 's claim that the investment in pollution control measures make it economically unviable has little truth in it. If you look at the financial performance of the Grasim company, it has been making a net annual profit between Rs 230 crore and Rs 637 crore between 1993-94 and 1997-98. The company's average annual net profit is Rs 381 crore in the past four years," says Chandra Bhushan of cse . "Even if gil implements all the recommendations of the Sengupta Committee - and more - it will not take more than Rs 25 crore, which is a mere 1.3 per cent of the company's average annual profit," says he. Surendranath points out that in Kerala, no one is prepared to take the notice on face value. Trade union leaders, who have been working as spokespersons for gil when the agitation against the company was really strong, have come out against the company, he says. "They say that the closure threat is nothing but a blackmail tactic to gain more raw materials from the government. While saying so, they have also admitted that the company had not done what it should have done to implement the recommendations of the Sengupta Committee on pollution control. The trade unions are now working out ways and means to put pressure on the government to reject the company's demand for closure," the cac representative observes. "The closure notice is a trick by the company and the government is acting in collusion with gil . So far, the Kerala government has not given permission to any industry to close down. The chief minister has held two meetings with gil representatives to find a solution. But the meetings were held at Delhi and Bangalore to avoid adverse publicity within the state," says M K Prasad, member of the state executive committee of kssp . "The plant should not be allowed to close down, but the government must ensure that gil implements the recommendations of the Sengupta Committee. The company should obtain its raw materials from sources other than the government, and especially not at subsidised rates. But my feeling is that the government will succumb to the pressure from the management, the trade unions and the political parties to give the company a fresh contract for raw material supply at subsidised rates," says Prasad. And if the plant does close down, there is the issue of compensation to the victims of pollution and the cost of the clean up of the surrounding environment. "Grasim should not be allowed to do a repeat of the Union Carbide escape act in Bhopal. When they close down, they must be held liable for the environmental remediation of the site and for medical rehabilitation of the workers and affected members of the commu-nity," says Nityanand Jayaraman of the environmental pressure group Greenpeace. "Grasim cannot just close and move. They have to clean up the toxic legacy left behind by three decades of their polluting existence," he says. 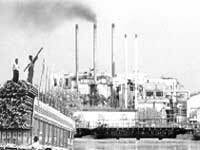 "They also owe it to their workers who may have borne the brunt of the pollution inside the factory.